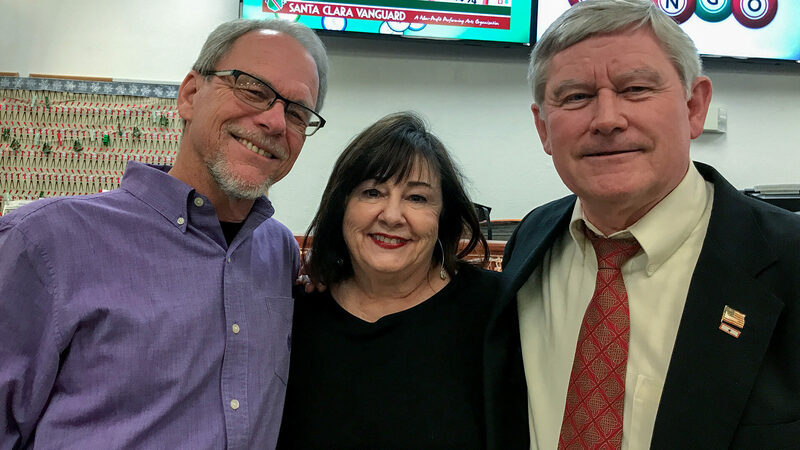 The Santa Clara Vanguard organization kicked off its 51st season on Saturday, March 17, with its annual Birthday Brunch event at Vanguard Hall in Santa Clara, California. While the focus of the morning was a preview performance of the Vanguard and Vanguard Cadets as they count down the days to their 2018 summer seasons, the program also included a look at some of the organization’s other performing groups including its youth percussion and brass ensembles. The event also served as an introduction and induction of the Vanguard Music and Performing Arts Hall of Fame Class of 2018; JW Koester, Dan Smith and Stephenie Hebert. After breakfast, Vanguard Music and Performing Arts executive director Charles Frost got things rolling with a recap of the organization’s 50th anniversary season and an overview of Vanguard’s ongoing commitment to community involvement. Frost also invited guests to visit the organization’s refurbished brass and percussion rehearsal facilities after the presentation. 2018 Vanguard Hall of Fame inductees JW Koester, Stephenie Hebert and Dan Smith. The Hall of Fame introductions kicked off with JW Koester who in addition to his time as a marching corps member, also served as director of the Vanguard Cadets (1987-1994) and Vanguard (1996-1999). He also returned to the organization from 2009 to 2012 as a tour director. Inductee Dan Smith recalled being introduced to the late Gail Royer, who as director ensured that all members of the Vanguard horn line could read music, something that wasn’t always common in the 1960s. He explained how that had a significant influence on his approach to music education. After teaching a variety of drum corps, Smith continues to judge across a wide spectrum of the marching arts. The final hall of fame inductee Stephenie Hebert is an original member of the Santa Clara Vanguard and longtime volunteer. Most visibly over the years Hebert has worked as a member of the corps’ souvenir staff, but she also has helped fit corps member uniforms which she says has created many lasting memories. 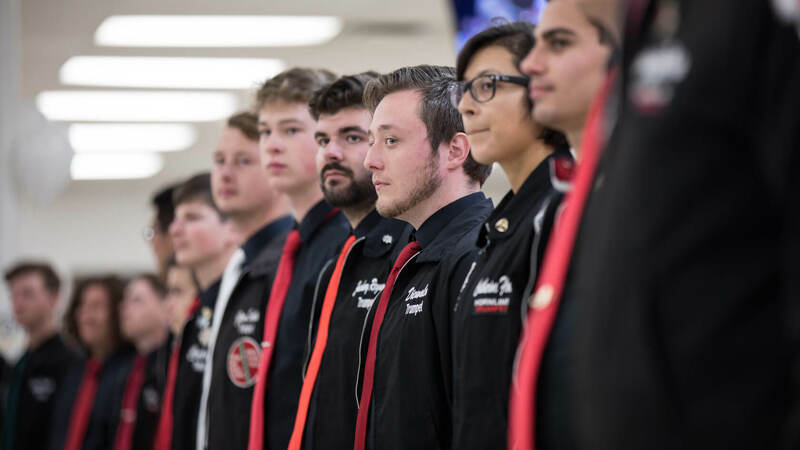 Santa Clara Vanguard and Vanguard Cadets members, who were in town for their March rehearsal camps, then circled the interior of the venue for a truly intimate performance. Vanguard corps director Shaun Gallant introduced the first piece, “The Canyon,” from the corps’ 1999 DCI World Championship-winning show. The Vanguard Cadets were then introduced by director Steve Barnhill. The corps performed two pieces from the group’s 2018 production. Once the dust had settled, Gallant returned to introduce the Vanguard. Like the Vanguard Cadets, the title and concept of the corps’ 2018 production is still under wraps and won’t be announced until sometime in the near future. They performed three movements from their show. Santa Clara Vanguard and the Vanguard Cadets will kick off their 2018 summer tours on Friday, June 22 in Clovis, California.